The Quoizel Kendra semi flush designer drum 3 lamp ceiling light in mottled silver finish, a superb quality cast wrought iron light fitting from Elstead Lighting and designed by Quoizel. If you have a period home, no longer do you have to traipse around auction rooms and antique shops for a perfect period light. With a vast selection of chandeliers being designed specifically for older style property you’ll be amazed at just how easy it is to find one that suits your decor. 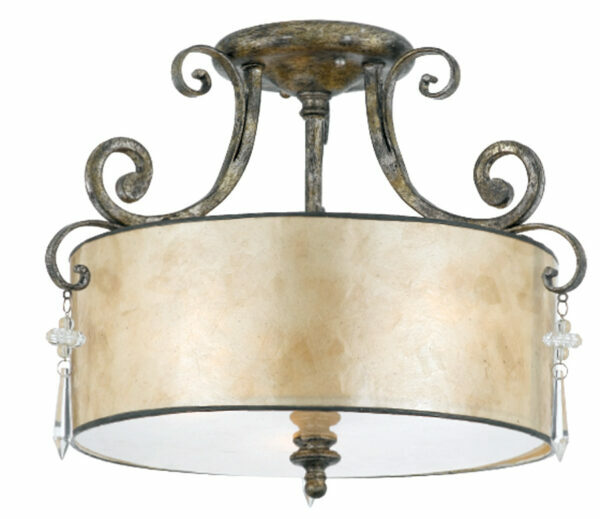 The Kendra semi flush drum light has a heavy cast frame with scrolled detail. Rather than a flat finish, the wrought iron frame is finished in a hand applied mottled silver over bronze and is decorated with an ice crystal drop accented with small a floral cluster. The large pearly mica shade adds a classy touch and sophistication to this classic design. This lovely semi flush is a modern interpretation of a truly classic design and features an elongated ice crystal drop accented with a small floral cluster that adds interest and sparkle. It is supplied with a pearly Mica shade that will illuminate any traditionally themed home with natural elegance.